"Long, long ago, God descended down to the world engulfed in darkness. With the threads made from a sheep's wool, He created a wondrous piece of cloth, which gave rise to another world. That world is known as 'Divine Cloth'." This legend was passed down from generation to generation. Beneath the Earth and Divine Cloth is a world engulfed in darkness. There lives the creatures that were sealed by God known as Bugs. Frequently, Bugs plunged out of that world, creating holes on the Divine Cloth. To fix these holes and reseal the Bugs beneath the ground, two people, a young man and a woman, Ryle and Marino set out on their journey. Kanata's lovely cousin, Yozu, is coming to live with him and his elder sister, Haruka, for high school. Unfortunately for him, Yozu has an intense fear of boys after coming to visit a few years ago and being tortured by a certain boy with frogs and snakes. What is he going to have to do? Thanks go to Unproductive for the summary. Yoshino Shinya is a high school boy who is bullied all the time at school, which leads him to have no friends. However, no one knows that he is actually half-youkai, and due to that, he has the desire to eat human flesh. But because of the promise he made with his youkai father never to prey on humans, Shinya tries to resist his youkai blood that is thirsty for human's blood, and live as a normal high school student. Will he be able to keep the promise he made with his father and keep his secret hidden? Hmm... well, another slow week. I guess if I had to pick a series to scanlate, I'd go for Yoru to Yakusoku. 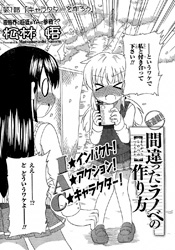 Also, Kachou Reijou officially starts so if you only checked out the one-shots a while back (back then they were labeled as chapter 1/2), then now is the perfect time to check out the first chapter. I might translate that if no-one else will. 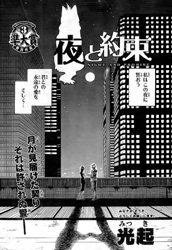 btw typo on "yoru to yakusoku" says "shouInen"
im looking at some of the tittles... may trans something. Thanks, c_k. 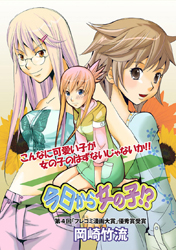 Machigatta Light Novel no Tsukurikata looks interesting. 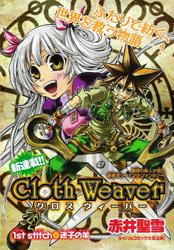 c_k...umm...Cloth Weaver doesn't have the second chapter (yet)...it's my big and small versions of the raw...>___<"
Machigatta Light Novel no Tsukurikata seemed interesting. Ha, Kyou Kara Onnanoko!? (今日から女の子!?) is so short, any summary will be a spoiler. I don't know why, but I'm looking forward to seeing Cloth Weaver done. It looks interesting in it's own way. I always have had this character that uses giantic scissors as a weapon (since early chilhood), so thats why I am some what interested in Cloth Weaver. At least assuming by that pic, the protagonists uses scissors. Other way, the last one could be interesting. No. 2 was mildly interesting....I might translate it sometime over the next few days if I can squeeze out a few hours here and there. I can't wait to see how CW goes. I like Yoru to Yakusoku. I wonder how he keep his secret hidden in the high school.